The RS2 is a tiny nymph developed by a gentleman name Rim Chung in Colorado. 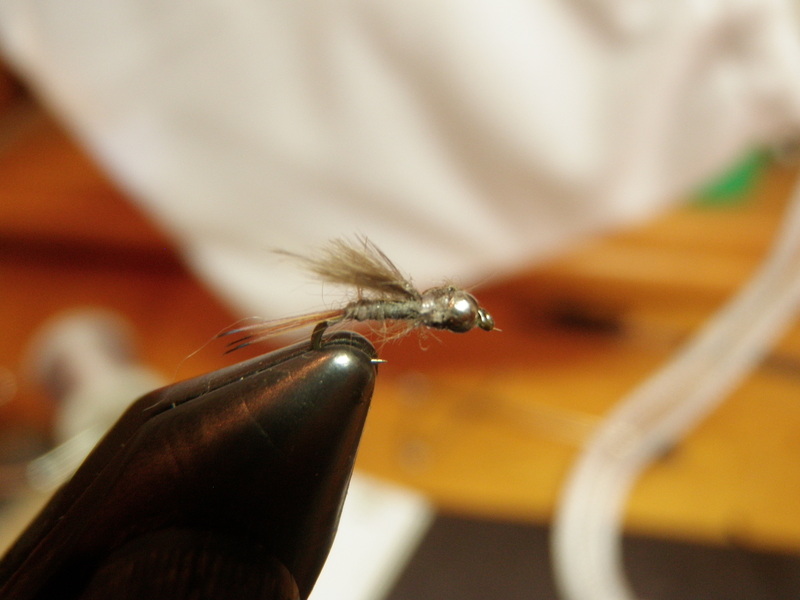 Orignally this fly was developed to fool the selective trout on the South Platte River in Cheesman Canyon and Deckers. I’ve been tying RS2’s since I first heard of them and read about them when I moved to Colorado in the early 90’s. The original pattern uses muskrat guard hairs for the tail, muskrat fur for the body and then a tuft of the fluffy marabou style feather that is found at the base of partridge and pheasant feathers. I’ve modified it a bit by adding a tiny silver colored bead behind the eye, and I substituted brown fibers from a hackle or pheasant feather for the tail. I no longer have the patience to pick through a muskrat patch and pluck tiny brown guard hairs. I’ve caught a lot of fish, so I don’t think the fish discern any differences. I nearly always tie on a RS2 when I spot tiny mayflies in the air. The primary mayfly that seems to result in RS2 success is the baetis, also referred to as blue wing olives. These mayflies are very small and typically range between size 18 and 24. I use size 20 and 22 RS2’s the most to imitate the nymphs of these mayflies. Most of the best blue wing olive hatches occur in Colorado in the spring and fall. The spring hatches tend to be slightly larger than the fall hatches. I added the beadhead to my RS2’s so I could fish them as a dropper below a large indicator fly such as a Chernobyl ant or Letort hopper. This works sometimes, but more often I’ve discovered that working a RS2 deeper with a strike indicator, split shot and another larger nymph as the top fly produces more fish. I’m guessing that the nymphs emerge in deeper runs and swim rapidly from the bottom of the stream to the top, and the action of the swinging and lifted nymphs with the split shot comes closer to imitating the emergence. In 2010 I was fishing on a Thursday on the Frying Pan River in September, when a blue winged olive hatch occurred at the tail end of green drake and pale morning dun activity. I added an RS2 to my PMD imitation and caught a few fish, but I felt like I should be attracting more attention given the intensity of the hatch. When I returned to the stream the next day, I decided to go deep with a beadhead hares ear and RS2 using a strike indicator and split shot. I experienced much more success using this technique and even maintained this approach as I spotted fish rising to take surface flies. Trout love to hammer the RS2 at the end of the drift when the line begins to swing across current and lifts the nymphs toward the surface. This day on the Frying Pan River probably represents my most successful RS2 day in 2010.